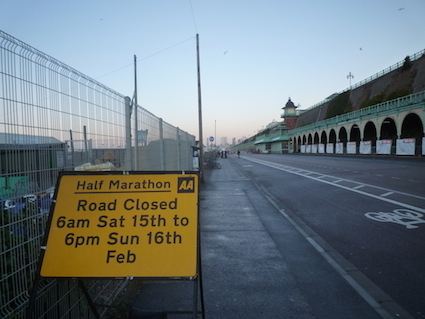 On Sunday 16th February i was down in Brighton for a spot of event work at the Brighton Half Marathon. 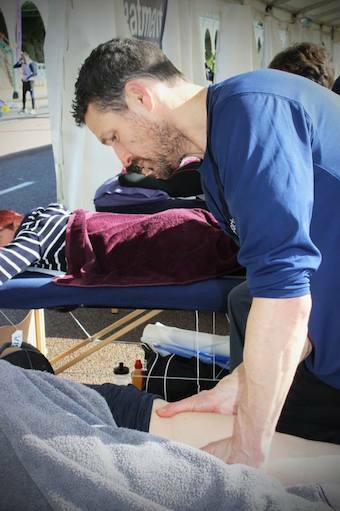 I first did this event a couple of years ago which, as well as being a very popular and fun event, has the added bonus of the therapy being provided by my good friends at Studio57 clinic. 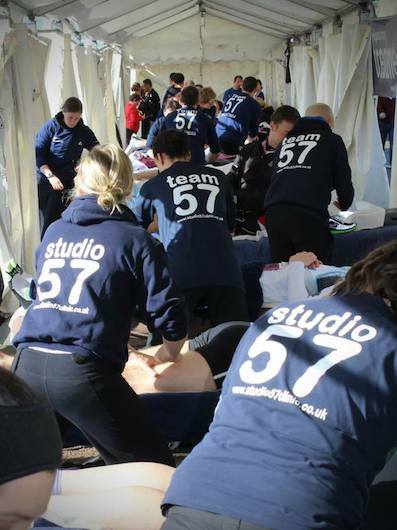 Studio57 Clinic, run by the lovely Mitchell and Elle in Hove, provide a lot of the therapy for the running events around the Brighton and Hove area. 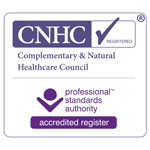 Their state of the art clinic caters for all types of runners as well as people with sports injuries or postural problems which of course i would highly recommend! Luckily for us on that day the god’s looked down and blessed the event with amazingly perfect conditions! This coming in the middle of some of the worst weather we’ve seen for years making us all very lucky. In fact some of the runners were even too hot in the sun and blue skies having prepared for a potential weather horror show! As usual we therapists all arrived bright and early to set up before all the runners arrived as nicely illustrated in this pic. Once we had set up this gave us therapists time to have a cup of tea and to scoff some cakes for charity, as you do, before reporting back to the treatment tent for the pre-race treatments. These started from about 8am ready for the runners to be at their start pens for 8.30-9.00 am. The treatments are gentle enlivening ones with rocking, gentle Tapotement and stretching which are as much to help calm nerves as they are to ready the physical body for the run ahead. 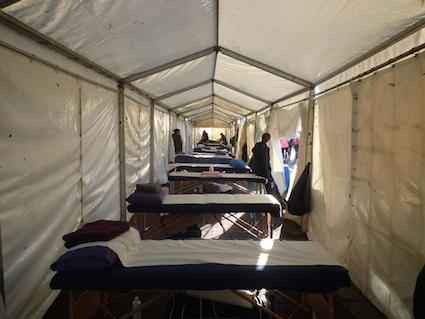 Once we had done these treatments we had a great view from the treatment tent of some of the 11.5 thousand runners that were there. 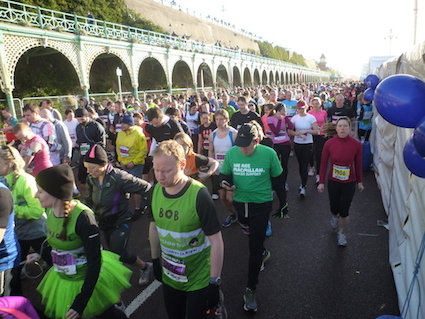 Brighton is one of the busiest half marathons in the country being perfectly placed in time and location for people training for the London Marathon in April. Like running events all over the country many of the runners are running for good causes, charities and causes close to their heart. 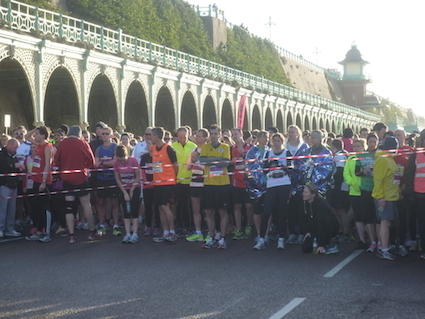 Brighton is no exception as shown by this picture as the runners streamed past us. Once the race has started we had another little break before the madness started! We can fuel up ready for the next few hours and make sure that all our kit is in order where we will need it since once the runners start coming in post race there will be very little time. At this point the treatment tent looks lovely and calm with no inkling of the furious activity to come from the 18 therapists present! This year this calm time was even less with the winner coming back in a scorching 1hr 5mins 52 secs! He was followed by four other runners running 1hr 6-9mins making five sub 1hr 10mins!! Very good times indeed. For the therapists at a half marathon we know that from about 1hr 20-25 mins onward for another 2-2.5 hrs we will be super busy since the bulk of the runners will finish between these times. This is unlike a marathon where the runners get more spread out. This of course is exactly what happened! Once into this period the organizers from Studio57 marshaled the runners coming into the tent for treatment taking down any injuries or contraindications before bringing them out to one of the 18 therapists working at full throttle. This allowed over 180 runners each with their 15 minute time slots to be seen in this time! This next pic gives you a little idea of this time! Mitch never did understand product placement at college! Runs of this length will usually find out any weak spot in the runners bio-mechanics leading them to come in complaining of sore Hips/Gluts, Hamstrings, Quads, Calves or Ankles/Achilles tendons etc. Due to sub-optimal running bio-mechanics one (or more) of these areas will be overly worked and so require some TLC from us post run. Personally i saw people with issues in all of those places the only notable omission for me being no sore lower backs. There were some runners however who simply wanted a treatment to help with their recovery as they had no actual problems i.e. runners with good running bio-mechanics! Obviously post race treatments need to be quite gentle as many of the runners are quite tender. We also need to quickly assess and prioritize what we will focus our treatments on as there is only 15 mins to play with. In addition to this treatments are usually to drain the muscle tissues to help speed recovery and then to gently stretch tight muscles back to a nice usable length so that the runner who hobbles into the treatment tent can walk on their way out. 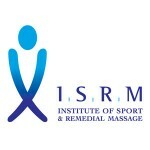 I find Muscle Energy Techniques especially Reciprocal Inhibition (RI), which uses the antagonist to stretch a tight and potentially slightly strained muscle without firing that muscle up directly, to be of great use for this. Then finally as quickly as it had started it seemed, we had finished. I worked on one of the last runners through, a remarkable man who had stared running marathons/ half-marathons for charity after beating cancer only to subsequently break his hip! 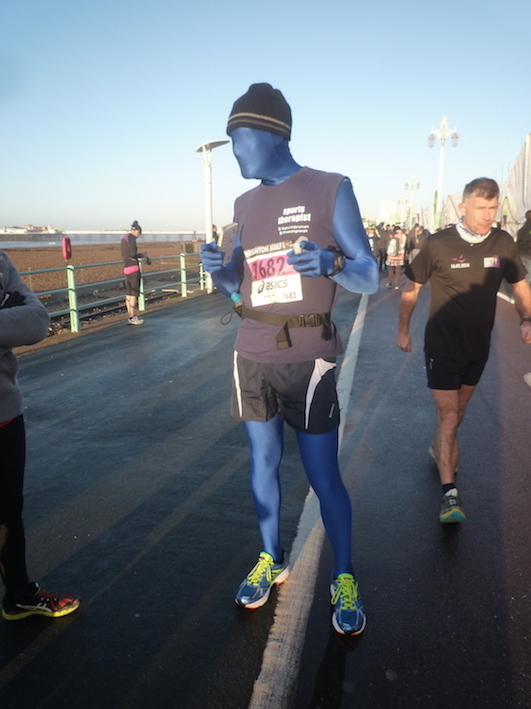 This was his first half marathon since the break and formed part of his training for the London marathon giving him heart that he would complete the full distance as he felt so good. Very inspiring! Finally i will leave you with an image that to me sums the day up. The enigma that is Running Morph!